In this quick-start Blender 3D will be used to make a very simple item. The aim is to provide a basic overview of the process using a starter or example file, how to set up a furniture item, its exported from Blender as an FBX file, its import and assembly in IMVU before being uploaded to the catalogue. 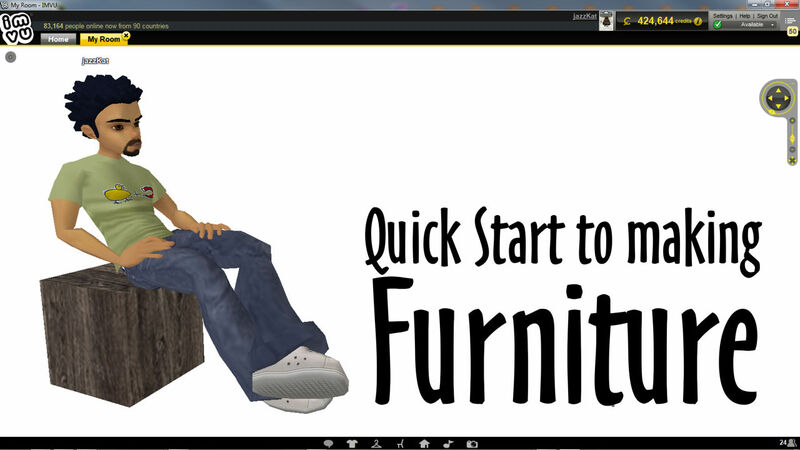 Download the *.blend furniture starter file here. 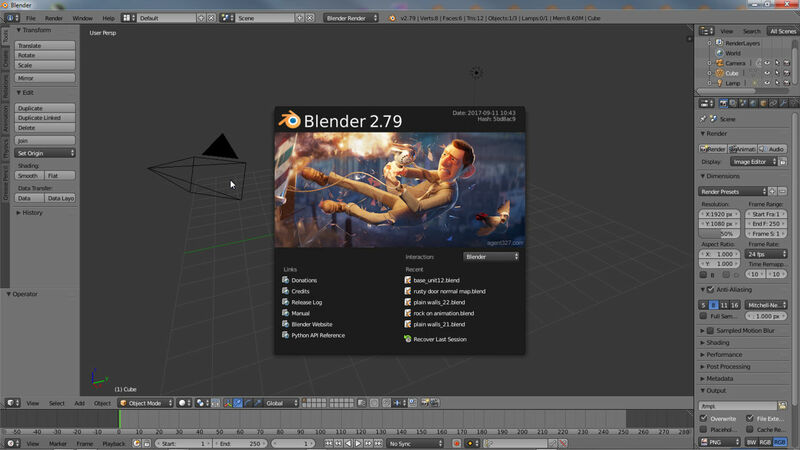 When starting Blender for the first time this is what appears. Left-click any where other than the Splash Screen overlay to close it and access Blender fully. The big area in the middle is where most work goes on. Left-click to select, change and edit properties and options. Middle-click to manipulate the 3D scene and areas (editors). Right-click to select user generated data and objects. Blender has a lot of features, beyond basic editing and object manipulation, .many are not needed for IMVU content creation. Blender appearance when first opened. Click anywhere other than the Splash Screen to start. With the furniture start file downloaded it can be opened into Blender by clicking File » Open top-left. This opens the File Browser a built-in asset browser that displays the contents of a folder or directory much like Windows Explorer or Mac’s Finder – it works the same way. Browse to and select the *.blend file – furniture (nodes).blend – it highlights orange indicating selection. Click the Open Blender File button top-right completing the process. Blender will return to the previous view. To navigate directories click the folder icon in the main view and/or click a System item to explore a drive or location. Using Blenders included File Browser, browse to, select and open the starter file into the application. 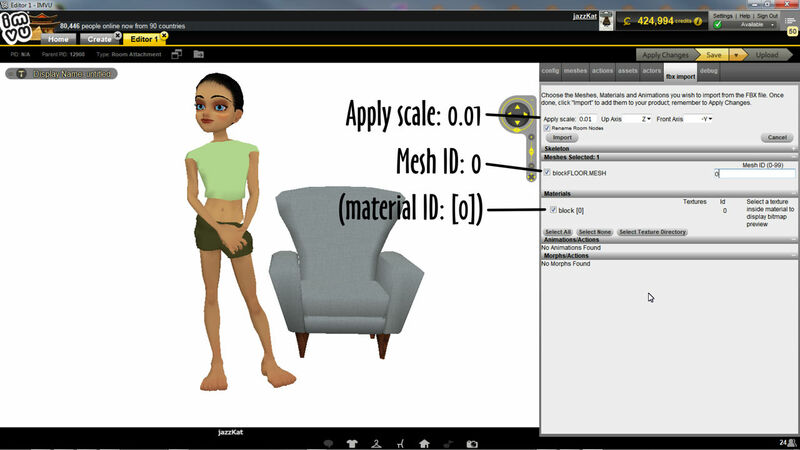 Looking at the starter file three meshes are visible; a block roughly centre-screen, the basic furniture item; two avatar helpers representing the default poses or avatar spots available for use when making furniture, sitting (*.Sitting) and standing (*.Standing). Each mesh is accompanied by one or more nodes representing different aspects of the skeleton furniture items need to work properly in IMVU. The block and its node will form the basis of a simple furniture item. To learn more about the Starter File click here. The avatar dummies help with scaling meshes and locating spots for avatar seats. They are not exported. 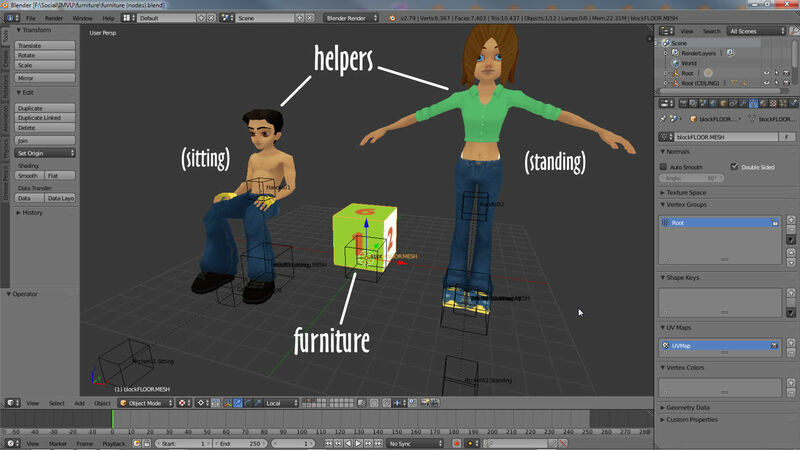 The Blender starter file include two avatar helper meshes (dummies) and a block representing a basic furniture item. Each has an accompanying node or node set. To make the furniture a little more interesting, and useful, the sitting seat can be included. First it should be moved into position. Right-click the large node directly beneath the avatar mesh called seat01.Sitting. The manipulator widget moves to it confirming selection – press ‘.’ (period/full-stop) if this doesn’t happen. 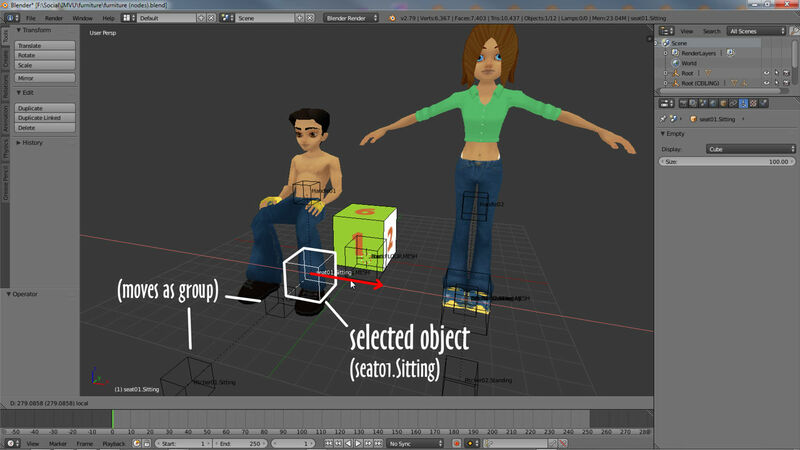 Left-click drag the coloured arrows and reposition the selected node so the avatar sits atop the box – the seated helper and nodes will move as a group. Release left-click to complete the action. To learn more about avatar seating click here. Leave enough room between the avatars feet and the block to accommodated the avatar swinging its legs backwards when switching poses when the product is being used. Add interest to the block and make it more usable by including the seated avatar – right-click the seat node directly underneath and position the group using the 3D widget. To ensure the seat is properly associated with the furniture block all the nodes belonging to the seat group need to be linked to the furniture’s master node, Root. This creates the necessary skeletal structure IMVU needs for products to work properly. Right-click one of the seat nodes then hold down Shift and right-click the remainder – this should mean Handle01, seat01.Sitting, Catcher01.Sitting and Pitcher01.Sitting are selected. Last but not least, still hold Shift, right-click Root. From the Object menu select Parent » Object, then Object (Keep Transform) in the pop-up that appears. Repeat the process this time selecting the mesh block, Root node, and Parent again. This ensures everything is linked properly. To learn more about Parenting click here. Selection order is important when linking nodes together, Root must always be selected last in a group. The furniture items skeleton is made from objects parented to a master or Root node. 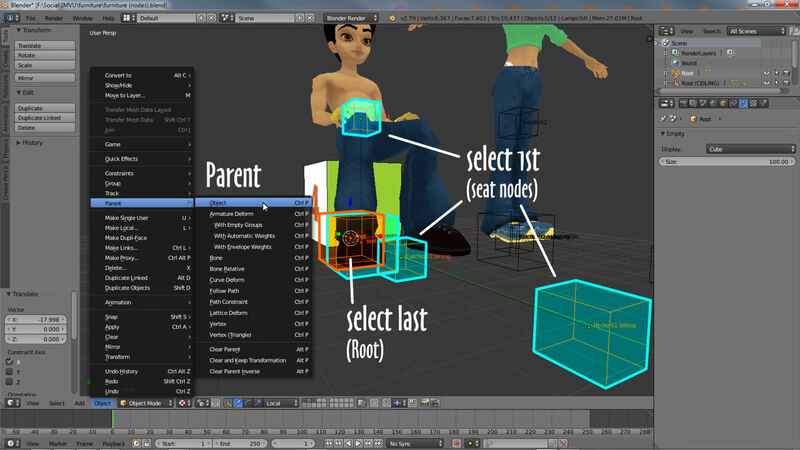 Select seat nodes, mesh and Root (last), then from the Object menu click Parent » Object, Object (Keep Transform). To export the completed seat all the elements need to be selected so Blender knows what needs to be processed. Using Shift+right-click select all the seat nodes, the root node and the block mesh, six objects in total (avatar mesh not needed). 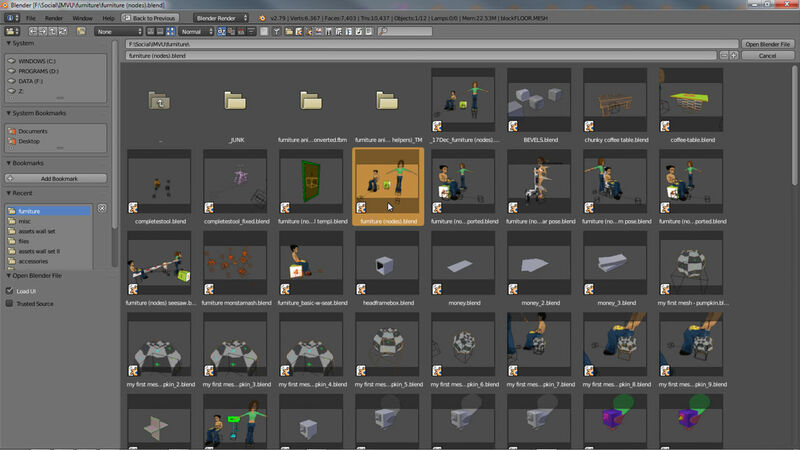 From the File menu select (File ») Export » FBX (.fbx). In the File Browser type a file name if necessary (Blender defaults to the *.blend files name) and set the save location (defaults to same folder *.blend is saved to). In Export FBX setting bottom-left make sure Selected Objects is enabled in Main, Apply Modifiers is enabled in Geometries, and Add Leaf Bones is disabled in Armatures. Click the Export FBX button top-right to complete the process. For more help exporting to FBX click here. To ensure Blender exports a compatible FBX file select the objects to be included and make sure at the very least Add Leaf Bones is disabled in Armatures. Importing furniture into IMVU is relatively straightforward because all the necessary components are included in the FBX exported from Blender, in this instance mesh, materials and skeleton. In Create mode start a new project and select Furniture as the product type. When the Editor appears click the fbx import tab then browse, select and load the FBX file clicking the Load FBX button. Change Mesh ID to 0 (zero) and Apply scale to 0.01. Check a material is selected then click the Import button. The panel will clear indicating import and conversion has completed. 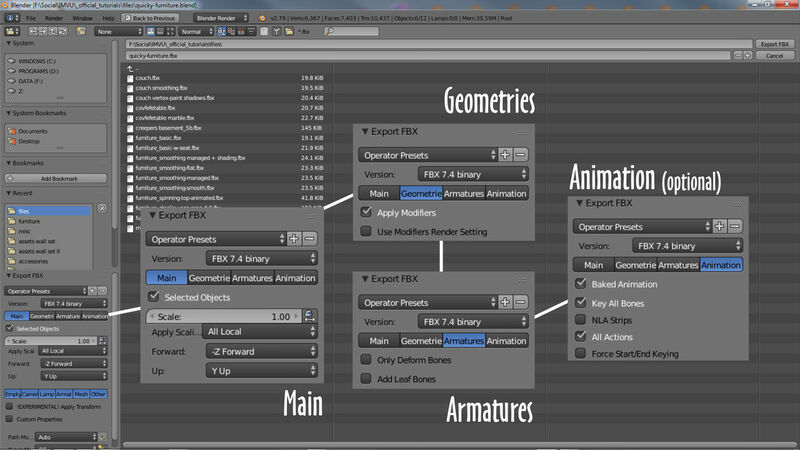 For more help importing FBX files click here. If a material is not assigned to the mesh IMVU will generate a temporary place-holder. Import settings to use when loading a Blender exported FBX file in for conversion, Apply scale being the important one, which should be set to 0.01 from 1.0. Once IMVU has finished the import process, to see the result click Apply Changes, the assets contained in the FBX file will be automatically assembled and displayed in the main 3D window. This is the basic furniture item. To make it look like a block of wood, click meshes to reveal the materials and images assigned to the project. Select material ID 0 (zero), the blocks default, then click the Edit button in Texture Assets to browse to, select and open a replacement image. Click Apply Changes once more to update the project showing a wood texture instead of the original green and white checker. Materials associated with original derivation remain in place unless replaced, i.e. block would need three assignments (,  and ) instead of one (). 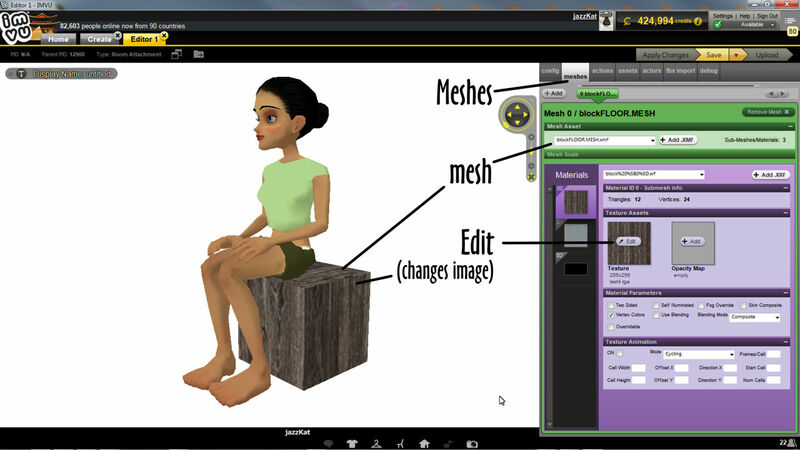 IMVU automatically assembles the product ready for editing, click the Edit button for the selected Material in Meshes to replace the imported texture with another, wood for example. 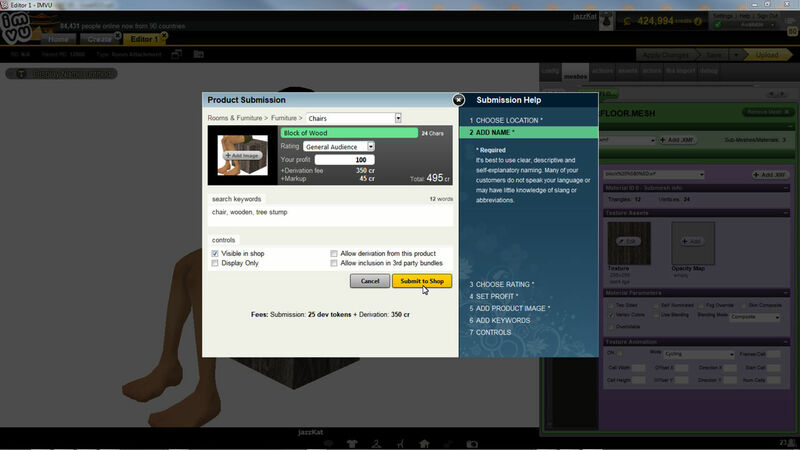 Once the product is assembled and textures replaced it can be saved and uploaded to the catalogue. Click the Save button then Upload. In the Product Submission screen give the new item a name, e.g. Block or Wood, set the Rating (General Audience) and an amount for Your Profit, e.g. 100 (note the total cost to the customer lower-right). Click the + Add Image button, select and open a 100 x 80 pixel jpg, png or gif image to use as the products thumbnail that’s displayed in the store. Finally click the Submit to Shop button. In the web browser that opens click the text at the top of the page – Click here to publish it – to fully publish the product completing the project and making it available for purchase. The web page that appears is the product description page that displays information about the product to the customer. It can be edited clicking the Add HTM Description link at the bottom of the page in the Creator Tools info bar. Once the furniture item is assembled it can be saved locally and uploaded to the catalogue – add a name, rating, thumbnail and set a profit.